From time to time this blog veers a bit off course from its normal politics and pop culture fare to cover health and fitness. I wrote on Schwarzenegger’s “Six Rules for Success. I discussed running and the importance of being humbled. 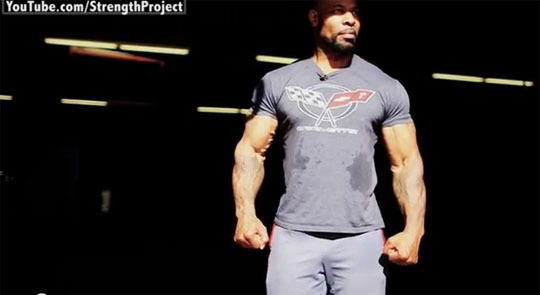 And now, I get to bring to you a short video on CT Fletcher, who in a sane universe would be approached by Marvel to play an older version of Luke Cage; the guy looks like he could walk through a brick wall. CT’s story provides a humbling tale and a message of hard work that I love. To top it off, he’s over 50 years old — and regular readers know I like writing about older guys who continue to sling the weights around despite all of society’s sick incentives to become soft and weak. Dude, you’re right. He would make a great Luke Cage. His fists look like they’re made of granite. I’m jealous. No doubt. His fist-to-head size ratio is unbelievably comic bookish. Freaky. He kinda reminds me Keith David if he was blasted with gamma rays.